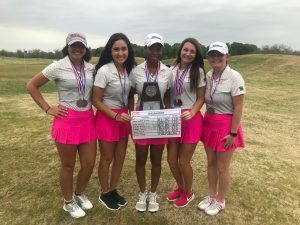 The Waxahachie Lady Indians qualified for the Regional Golf Tournament after two days of exciting golf. The team shot 348 on Thursday to be tied with Mansfield Gold going into the final round at Tangle Ridge. The Lady Indians came through and held off Mansfield Gold by shooting 348 on the final day to be the District Runner-up by 4 shots over Mansfield Gold. Mansfield Black was the District Champions with a 678. The Lady Indians were led by Baylie Paris who shot 83-85 for a 168 and was tied for 2nd overall medalist. She fell to 3rd medalist in a sudden death playoff. Olivia Tolliver (90-85) and Ana Herrin (88-87) both finished at 175. Marisabel Garza shot 87-92 for a 179 and Kayli Nash finished with a 98-91 for a 189. Baylie was named 1st Team All-District and Olivia and Ana were 2nd Team All-District. Playing as medalists in the Tournament were Vanessa Garza with a 96-91, Allison Heflin with a 110-105, and Mackenzie Parks with a 103-119. The last time the Lady Indians were at the Regional Tournament as a team was in 2014. Regionals will be held at Tangle Ridge on April 22-23.